Ultimate Finance (UF) are independent alternative lenders offering a range of financing products to UK businesses. They have funded over £1 billion to date, since their incorporation on 20th November 2001 and retain over 200 members of staff. UF have been backed by Tavistock Group, since September 2015, the private investment business founded by Joe Lewis over 35 years ago. They work in close partnership with the British Business Bank and they are members of the trade body UK Finance. Invoice finance - a full range of factoring and invoice discounting services. Ultimate loans - a long term business loan. Asset finance - to support the purchase of equipment. FlexiCredit - a newly launched funding line for small businesses. Trade finance - funding for importers to assist with payments to suppliers. Construction finance - specialist funding for the construction sector. Recruitment finance - sector specific funding for recruiters, including payroll management. UF have 7 offices serving the whole of the UK. UF were nominated for "Lender of the Year" at the British Small Business Awards 2018. In 2017, UF were winners of "Best Trade Finance Company" at the Trade Finance Global International Trade Awards 2017. 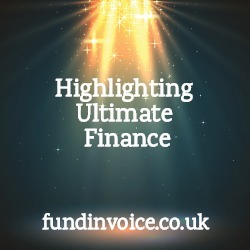 Blog post: Ashley Finance absorbed into Ultimate Finance. News: Ultimate Finance Appoints New CEO.